Growing demand has led the street furniture manufacturer to developing a custom-made collection of paving created to enhance and blend into existing landscape design and architecture. As an extension of Townscape’s current paving range, the new Prestige range is produced using a Vibro-cast method. The air is removed from the aggregate after being hand poured, delivering strength, flexibility and a high quality finish. Jonathan Goss, managing director of Townscape, said: “There is a growing requirement from specifiers and architects for an ‘out of the box’ solution. This is either because they are using innovative materials in a project or working to fit in with a heritage design and don’t want to compromise the aesthetics of a scheme because complementary paving isn’t available. Our new paving collection provides the design element they need, with the durability and quality they expect from Townscape. The new Prestige Vibro-cast paving comes in a range of sizes and can be finished with an antique riven, dapple or textured profile pattern which is produced using a former cast from a natural stone pattern. The fine Prestige mix eliminates the risk of delamination. Each profile pattern is available in white, black, yorkstone, cloburn red and grey. Townscape’s manufacturing facility means it can produce edgings, steps and drainage channels to coordinate with the scheme design. 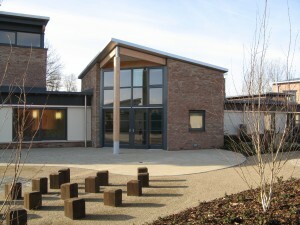 It is also able to make a wide range of precast copings and architectural dressings which blend and enhance natural stone or concrete elements elsewhere on the site. For full details on the Townscape’s Prestige Vibro-cast log onto: www.townscapeproducts.co.uk or call: 01623 513355. 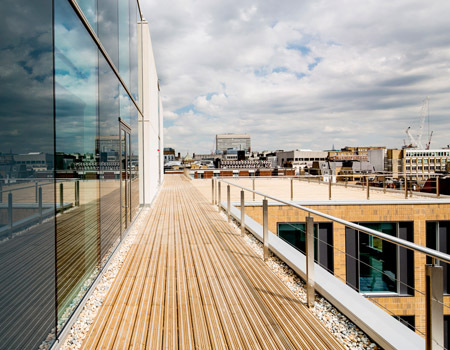 Treated softwood decking meets architectural aesthetics at mixed use development.